What is the surgery for adhesions? 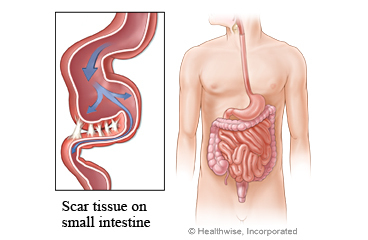 Adhesions are scar tissue. They form between tissues or organs and cause them to stick together. Sometimes they can cause the bowel to get blocked (bowel obstruction). Surgery breaks up and removes this scar tissue. The most common cause of adhesions in the belly or pelvis is previous surgery in that area. You will be asleep during the surgery. You may have a nasogastric (NG) tube during the surgery. This goes through your nose and down into your stomach. The tube removes fluids and gas. This helps relieve pain and pressure. There are two ways to do the surgery. You may have open surgery. This means the doctor makes a cut (incision) in your belly. Or you may have laparoscopic surgery. To do this type of surgery, the doctor puts a lighted tube and other surgical tools through small incisions in your belly. The tube is called a scope. It lets your doctor see your organs so he or she can do the surgery. In either surgery, the incisions leave scars that fade with time. During the surgery, the doctor will look for adhesions. He or she will also check your bowel to find places where it may be narrowed or blocked. The doctor may also remove damaged sections of the bowel. He or she will then put the healthy sections back together. In some cases, the doctor makes an opening in the skin on the belly and connects the bowel to that opening. This is called a colostomy or ileostomy. The opening in the skin is called a stoma. If you only have adhesions removed, you may stay in the hospital for a few days. You may be able to go back to your normal routine in 1 to 2 weeks. If the doctor had to reconnect sections of your bowel, you may stay in the hospital for up to a week. You may be able to go back to your normal routine in 2 to 4 weeks. If you have adhesions that partly or completely block the bowel (bowel obstruction), you may need surgery right away. You may not have time to prepare. The surgery usually takes 1 to 2 hours, but it can take longer. Enter J924 in the search box to learn more about "Adhesions: Before Your Surgery".